Alexis Weissenberg was born in Sofia, Bulgaria, on the 26th of July 1929. After having received his first lessons from his mother, he started piano and composition studies at the age of 5 with the leading Bulgarian composer, Pantcho Vladiguerov. “He was an intuitive, flexible teacher, rather than a square pedagogue, and gave us, his pupils, an early awareness of temperament as a tool rather than a spice“. At Vladiguerov’s, he was to listen to pianists such as Dinu Lipatti perform. He gave his first recital at the age of ten. “It was my first physical connection with the stage. I loved it. I played three Bach Inventions, a few pieces from Schumann’s Album for the Young, Beethoven’s Capriccio for the Lost Penny, and an Improvisation by Vladiguerov, and -as an encore- (I was so proud) an Etude of my own in G major, which I transcribed, at the last minute, in E flat major “because it sounded better“. In 1943, two years after Bulgaria allied itself with the Axis Powers, he left the country with his mother. In spite of being held for three atrocious months in a detention camp at the border with Turkey, and after a short stay in Istambul, they finally reached Palestine. There, at the Jerusalem Academy of Music, he had Alfred Schröder (co-disciple of Artur Schnabel) as Piano teacher and Joseph Grünthal (Josef Tal) for Harmony and Composition. Very soon he had his first concert with orchestra (Beethoven 3rd with the Jerusalem Radio Orchestra). 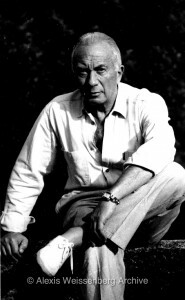 Just after the war’s end, Professor Leo Kestenberg offered him an engagement for three consecutive seasons, the last of which was conducted by Leonard Bernstein. He started a major tour in South Africa, consisting of 15 concerts with four different recital programs and five concerti. Then, in 1946, he moved to the US, with two letters of recommendation, one for Artur Schnabel, the other for Vladimir Horowitz. “One in each pocket, each one re-read 15 times. Both letters signed by Kestenberg. Both, separately, gave me the same advice. The inspiring teaching and influential musicianship and enthusiasm of Vladiguerov, during the years in Sofia, had prepared me pianistically in the best pedagogical tradition. What I needed urgently was broader knowledge, much more cultural information, also maybe the experience of a school as opposed to private lessons, one or two competitions (why not?) in addition to patience and listening to as much music as possible“. He received lessons from Artur Schnabel and Wanda Landowska and then went to The Juilliard School of Music, where he enrolled in Olga Samaroff’s class, who together with Rosina Lhévinne, shared the top talents of the times. He also enrolled in the Composition and Musical Analysis classes of Vincent Persichetti, himself an excellent composer, “who considered eccentric ideas and original thinking a must“. In 1947, he won both the Leventritt Competition and the Philadelphia Youth Competition. His career started quickly with these awards and, that same year, he made his US debut, with Chopin’s Piano Concerto no.1 with the New York Philharmonic Orchestra conducted by George Szell, and Rachmaninov’s Piano Concerto no.3 with the Philadelphia Orchestra under Eugène Ormandy. In 1956, he moved to Paris, where for some years he basically stayed away from the major stages, working on his technique and repertoire: “As a young artist, I learned new works very fast and played them much too soon. In 10 years, I would have reached a point where my whole repertory would have been overplayed and understudied. I did not want to end up at the age of 50 still a “promising pianist“. 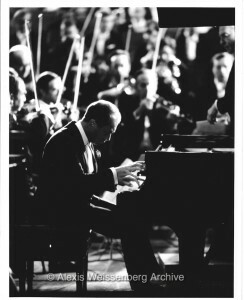 In the mid-sixties he re-launched his career, playing throughout Europe, the United States, South America and Japan, at the most important venues and with the greatest Orchestras; under the most famous batons such as Szell, Ormandy, Steinberg, Maazel, Giulini, Abbado, Karajan, Celibidache or Ozawa. He was also completely in his element accompanying singers like Teresa Berganza, Plácido Domingo, Montserrat Caballé, Ferruccio Furlanetto or Hermann Prey. “Since then I have had the same experiences as my colleagues: many anxieties and rewards of learning the profession; doubts and joys due to the inevitable tension between the instinctive impulse and the technique of the performance; the enormous individual responsibility resulting from technical skill and creative expression; the monotonous life between suitcases and concert halls; but also, and above all, moments of sheer delight when the communication -that magic interaction between audience and artist, between musical director and soloist, between two sensitive souls-, takes place. It is a life where the choices one makes reflect the powerful desire to improve, to perfect, to simplify, to revise, relearn and re-state. These are my greatest motivations and they are also the main source of my almost infinite hope!”. He started composing when he was a child, his first composition (at least, the first that has been preserved) being a little piece for solo piano that he wrote when he was 9 years old, and the last one, a jazz-flavoured piano Sonata, written in 1982. He has left several compositions, among which there are pieces for piano solo, for two pianos, transcriptions, song arrangements, cadenzas and four musicals. He was an excellent caricaturist and illustrator, and he created wonderful collages, mostly related to his extensive professional career, which are mainly exposed in Sofia’s Sala Bulgaria. His recorded legacy embraces a huge range, and though mostly from the Romantic repertoire, it also extends back to Bach and Scarlatti and forward to Prokofiev, Ravel or Stravinsky. He loved teaching and gave master classes all around the world. In 1993, he created the Alexis Weissenberg’s Piano Master Class in Engelberg, Switzerland, where he taught many of the young pianists of the new generation. 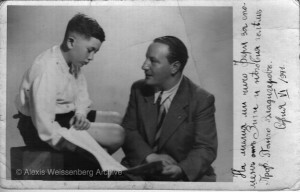 Alexis Weissenberg died in Lugano, Switzerland, on the 8th of January 2012.